Dart® Foam Hinged Lid Cont. -6" Large Sandwich, White | Clearfield Wholesale Paper Co., Inc.
5 7/8" x 6" x 3"
Hinged containers available non-perforated or with the PERFormer[TM] perforated hinge that allows the container's lid to be removed. Stackable. Secure closure. Has high insulation properties to keep hot food hot and cold foods cold. 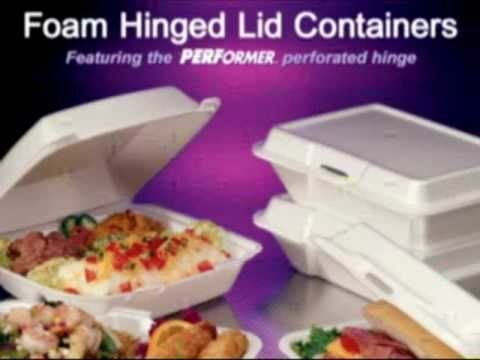 The vented container comes with the PERFormer[TM] perforated hinge. Vent holes on sidewalls of the lid preserve food quality (i.e. crispiness) by allowing steam to escape. These containers feature either a double lock closure or a "knuckle" locking tab intended to prevent accidental openings. When closed, a perimeter seal keeps food secure, reducing leaks. Tabs on base ensure container stay closed when picked up by the lid. Also available in black. 5 7/8" x 6" x 3". Hinge Style: Non-Perforated. Cargill Diamond Crystal® Flash Melt® Ice Melter - 50 lb. Dart® Concorde® Non-Laminated Plate - 10 1/4" Cmpt.